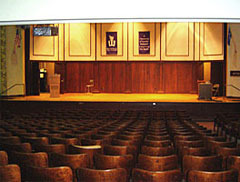 The Harriet Johnson Auditorium is the University's oldest and largest performance and lecture space, and features an adaptable proscenium stage and promenade balcony. 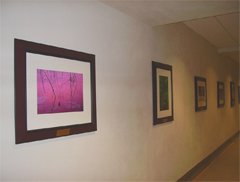 It is used for a wide variety of activities, including presentations, receptions, special performances, visiting lecturers, guest artists, and serves as the primary location for the university's Lyceum Speaker Series, the annual Winona Symphony Orchestra's Children's Concert, and the Frozen River Film Festival. The Somsen Mural was designed and executed by John Martin Socha (1913-83). 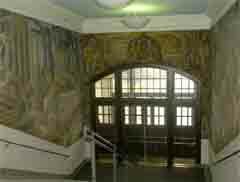 It was one of the largest of the New Deal (1935-43) Federal Art Projects in Minnesota, dedicated to Winona State Teachers College on November 7, 1938. Because of its origins, it is a protected artwork. We acknowledge that the artist relied exclusively on stereotypical imagery and white myths, which convey inaccurate and uninformed messages. 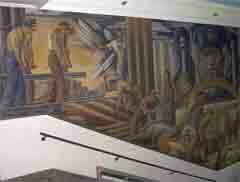 Rather than remove or destroy the Somsen Hall mural, the Winona State University community has chosen to give it context with commentary as a reminder that the responsibility of education is to examine tradition and learn from history to improve the future. Minnesota photographer Jim Brandenburg is internationally known for his nature and wildlife photography. 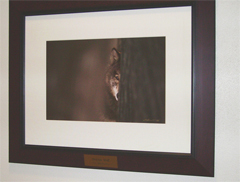 This collection features images shot in Minnesota, including the iconic “Brother Wolf. Located on the 2nd floor, it was dedicated in 2010, and made possible through a generous gift by Dr. Ervin Bublitz, retired WSU faculty member.